Dark Sea is the eleventh level of Jewelry Land in Yoshi's Safari, located in the Dark Realm. 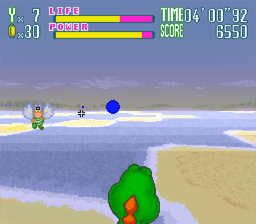 The level consists of a gloomy beach that Mario and Yoshi must traverse. After getting through hordes of enemies such as Cheep Cheeps, Bloopers, and Koopa Para Troopas. There are also several jump pads in which Yoshi needs to jump off of in order to cross large bodies of water. The player must be especially careful, as even one hit from an enemy can careen the duo into the nearby water. Mario and Yoshi will eventually reach the end of the beach and fight the Koopa Troopa Sub. The sub will fire green balls at the duo as they attack the Koopa Troopas manning the sub. 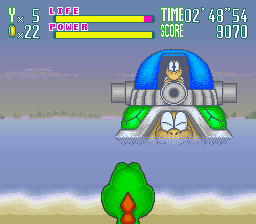 After all of the Koopa Troopas are defeated, the sun will open up three more cannons that shoot green balls at the duo. The duo must attack the sub's "mouth" when it opens; after they attack the mouth enough times, the duo will receive a gem and can finally continue to Bowser's Castle. This page was last edited on January 27, 2019, at 19:59.